My most recently finished project is "The Chocolate Castle" and since my son was nice enough to take quite a few pictures of it, I've set them up on their own page which you can visit by clicking here. These first two pictures are of a little vignette I made earlier this year for a friend's retirement. I found the boxes at A.C. Moore (they're great - glass on all sides!). The Adirondack chair was a souvenir from a Cincinnati Miniature Society show several years ago and the backdrop is from a wonderful week spent at Cape May quite a few years ago. I made the beach umbrella from one of those cocktail umbrellas and I made a little beach bag out of needlepoint canvas with a seashell picture pasted to the front. My friend is a Longaberger person, so I changed the magazines that came on the chair to Longaberger catalogs. The second picture shows the back of the box. Next are two pictures of the roombox I've made for my oldest daughter who is an avid pool player. I keep telling my daughter I'm not ready to give it to her cause it still needs some finishing touches - pictures on the walls, maybe a coffee table, etc. Actually, I'm just not ready to give it up yet! 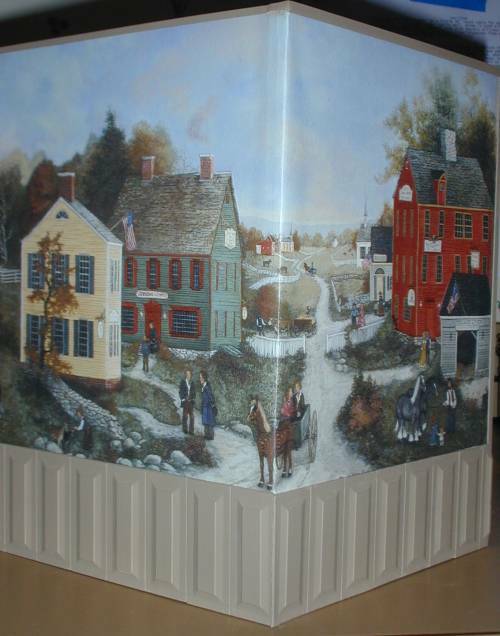 The pictures are pretty much the same - the second one is just angled a little to show the laser cut room divider I used. The only things I made in this scene are the rug in the sitting room and the fireplace. Most of the other items are either artisan pieces or souvenirs from NAME conventions. 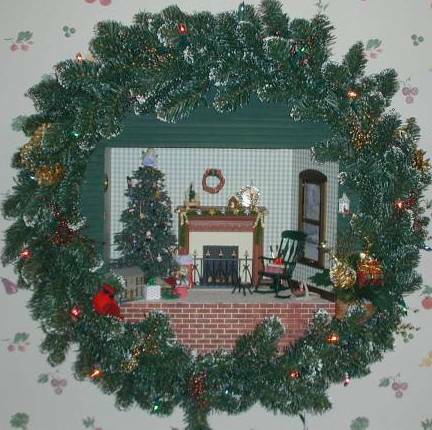 Here are a couple of pictures of a Christmas wreath that I donated it the hospital where I work (not anymore - I'm retired!!) for their annual Christmas Festival of Trees auction. I hung it in my kitchen for a few weeks before I took it in so I could enjoy it for a bit. AND...I won our wreath decorating contest! They're both basically the same picture - one is just a little bit closer. If you look outside the window you'll see a moonlit snowy scene (my real front yard!) Unfortunately, I couldn't get a good picture with the lights on - there are lights on the tree and the candle on the mantle lights up but it made too bright a light when I had them turned on. 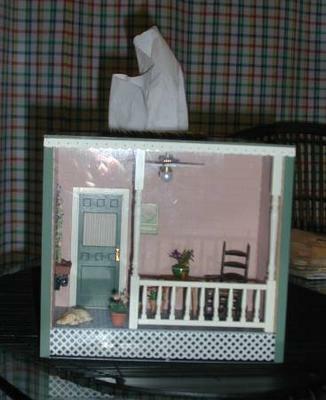 The second project was a Kleenex box cover scene - the kind where you build a box to fit over the cube size tissue boxes and then put a hole in the top for the tissue to come out of. I made mine small enough that I could make it half scale. The rocking chair was made by Ron and April Gill's daughter (I'm sorry I don't know her name). I made the ceiling fan out of a bead, jewelry findings, and an index card! 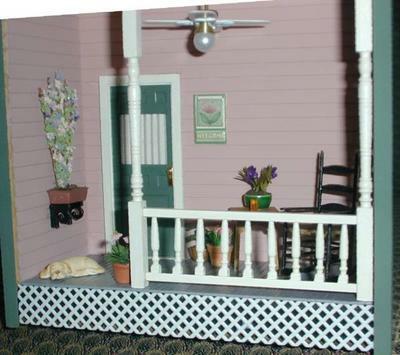 Most of the flowers were from various swaps, the little welcome sign is from a recent issue of Dollhouse Miniatures magazine, the "curtain" in the door window is the liner from a light bulb pack, and the lattice underneath the porch is plastic needlepoint canvas. Here are pictures of the storefront structure that was the major souvenir from the 2002 NAME National in Seattle. It was finished on the exterior as you see here and then it was up to each recipient to finish the inside however they wanted. I put in a white and black "marble" tile floor which you can't see in the pictures, electrified it with the hanging light you see and a pretty little wall sconce on the other side, plus a couple of hidden "fluorette" lights. I've named my shop "The Finishing Touch" - a store where you can find that special little "something" to make your home special. What it really is is a place for me to show off all the little treasures I've collected and haven't put anywhere else. 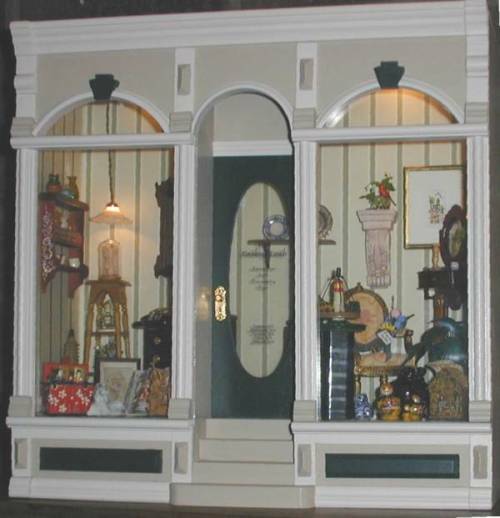 The first image shows the entire storefront. The next picture is the left side window. I wish the picture was better so you could really see what's in there. On the floor in front of the little nighstand is one of Barbara Brear's "open books". It displays an illuminated manuscript of the nativity and is so beautiful. The print behind the book is the same print I have hanging over the piano in my real house - a print I bought in Rome 30-some years ago which has always been really special to me. 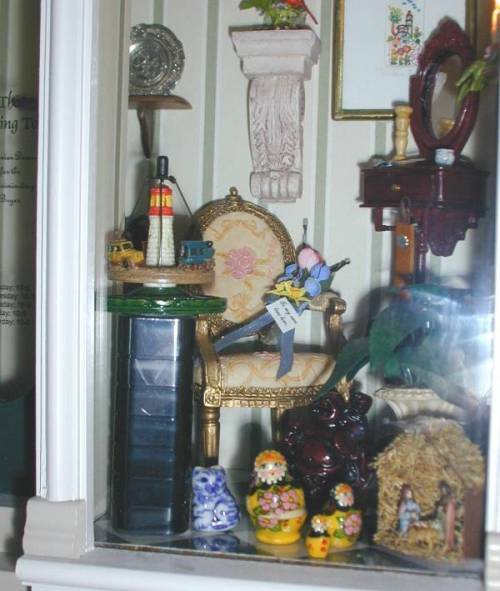 On the plant stand in the back corner is one of my two Olszewski Hummel figurines. This is the one of the little boy sitting on a fence. 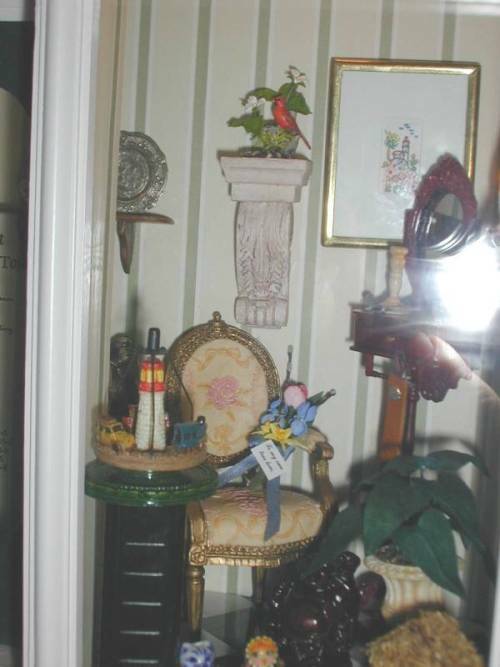 You can just see a tiny bit of the two silver horseshoe bookends that were a souvenir from the Louisville NAME National in 2001 and also a little bit of a beautiful walnut framed mirror that was a souvenir from the Charlotte NAME National in 2000. It was made by Marcia Gardner. On the floor in the front is a little red box from China. When it is opened, the lid reveals two rows of tiny, tiny dolls. It is one of my all-time favorite things and was a table exchange gift at the Charlotte National! The hanging wall shelf holds several pieces of my tiniest hand-thrown pottery pieces. You can't see them, but they're there. Next are two pictures of the right side - had to sort of point one up and one down to make the glare move around. On this side, right up front, is a souvenir from the Louisville NAME National - a "whirl-i-gig" made, if I remember right, by Geoffrey Bishop. It is so neat - twirls around and around with just a little twist of the finger and has a little boat, train and Woody station wagon on the ring. Another souvenir (from the Charlotte National) is the floral bouquet on the chair. The picture on the wall was a Christmas gift from my daughter - the actual painting is about 1/2" wide by 1" high! It's sort of a Mexican village scene. And the Bespaq shaving stand was a Christmas gift from my son. On the wall shelf (which is WAY too big and will be replaced) is my one-and-only-ever-in-my-life Mary McGrath sculpture - a cardinal sitting on a dogwood branch. 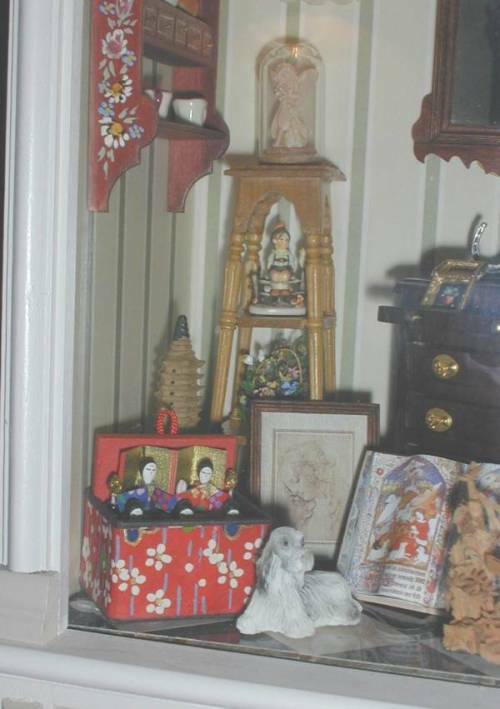 On the floor is a little set of Russian nesting dolls and a tiny nativity by Robin Betterley. The club I belong to in Gallipolis puts on an exhibit every October for the entire month and, along with whatever each member has made and wants to display, we do one group project. 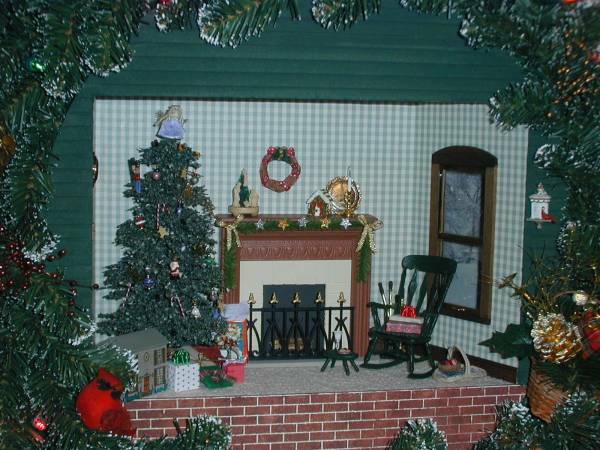 In 2001 it was "A Winter Festival" based on the projects by JoAnn Swanson in three issues of Dollhouse Miniatures magazine. This first picture is of the entire scene. One of my "booths" was "A Visit With Santa" and the other was a "Hats Off!" stall. Next is a project for the hospital where I work. They have an annual fundraiser every Thanksgiving and this is a conservatory that I built up for their auction. Barbara Plevan in Canada made all the plants and flowers and did an absolutely beautiful job. I wish you could see this project "in the flesh" because the colors are so much nicer than in the picture. There is a red clay tile floor, the back brick wall is painted a rich cream color and the French door is white. The geraniums are a beautiful peach color. You'll just have to use your imagination to help these pictures along :) So without further ado, here is my "Cozy Conservatory". This is a bookend I made as a club project. The little birdhouse was another club project - we made them from shingles. The "scene" is from some wallpaper border and the flooring is also wallpaper. I've used several swaps in furnishing this project also. 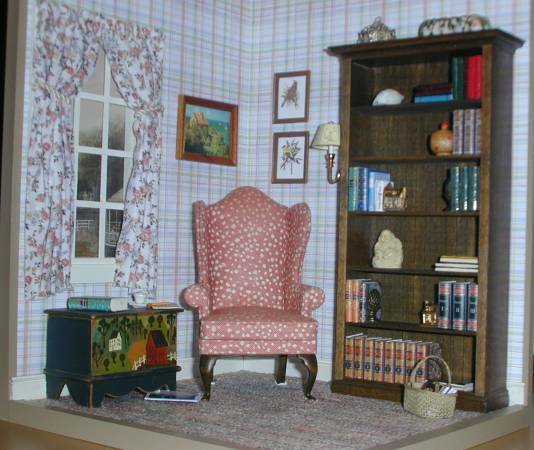 The living room fireplace, easy chair and bookcase were all swaps (although I added the "filling" to the bookcase, added a screen to the fireplace, and painted the chair and added an afghan). A lot of the items in the attic were also swaps, but unfortunately, back when I was doing these swaps, I didn't know to keep track of who sent what. I'd be delighted to give credit if any of my visitors recognize their own swaps here. The attic is the children's bedroom with a sleigh bed made from a Pam Junk kit.